LEAP (LEarning Archery through Play) was originally designed as a programme to bring children back to Nature. In this time of electronic games and gadgets, what LEAP can do is to promote healthy activities outdoors, using traditional archery equipment and horseback archery techniques as an outlet for fun and interactive play. Founded in 2007 in Kuala Lumpur Malaysia, LEAP Programme was inspired by watching 4 year old Abdul Rahman launching arrows from a homemade bow. Through lots of play, Abdul Rahman later proved to be the best archer amongst his peers when we started our first archery programme as an after-school activity. We later realized that the LEAP concept is not only an effective module for kids but proved to be a succesfull system for teaching adults as well. Students from all ages quickly pick up difficult skill sets during play which they would otherwise take longer periods to acquire. We found that kids and adults learn best through play, when they are enjoying themselves. Our games are designed to encourage teamwork, to develop strength, sharpen their instinctive faculty and to develop their focus and lengthen their concentration capabilities. These will all lead to a better overall performance in your daily lives. LEAP Programme is part of a continuous effort to develop a youth development programme using traditional horseback archery as a platform. 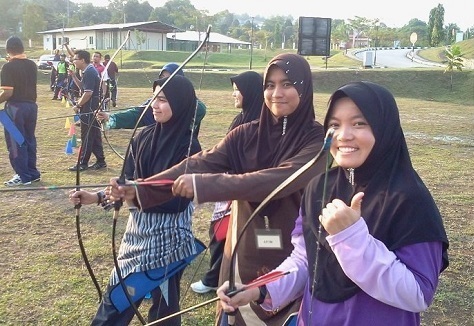 In 2009, LEAP Programme organized the first Malaysian participation in two international traditional archery events - Traditional Ground Archery and Horseback Archery competitions. Traditional Horseback Archery is a great human legacy that is being revived all over the world since more than 30 years ago. By introducing this programme to schools and other ongoing national programmes, Malaysians will be able to appreciate and enjoy the benefits that traditional horseback archery has to offer. LEAP Programme continues to explore various formulas to make traditional and horseback archery affordable and accessible. As the founder of the first formal Traditional Archery programme in Malaysia, LEAP Programme has sparked the growth of a new industry inviting artisans as well as businessmen into the traditional archery community. The year 2013 saw a dramatic increase in the number of new clubs or traditional archery groups and new archery schools established. From a handful of traditional archers in 2007, now thousands have been introduced to this wonderful sport and the numbers keep increasing.